Maybe it’s because it’s summer, maybe it’s because my to-do list is a bit overwhelming, maybe it’s because I only want to eat takeout cheeseburgers... no matter why, I’m still not super into cooking nowadays. I mean, I am making dinner, but I’m keeping everything simple... and still giving up and having a bowl of cereal occasionally. This “recipe” is made for cooking funks like the one I’m in. Yes, another “recipe” in quotation marks, because it’s not complicated, and it’s not something you wouldn’t think to do anyway. 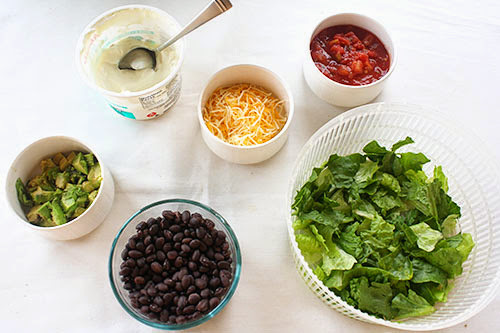 I figure if Tracy Shutterbean can keep it insanely simple every now and then, I can take the time to tell you how I make burrito bowls! 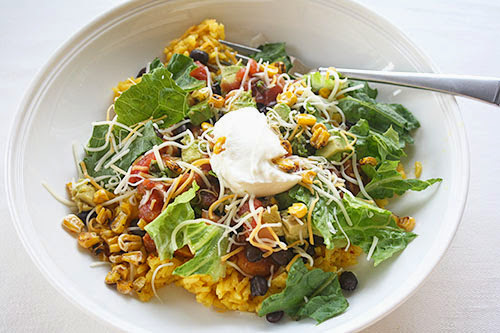 They’re similar enough to Beth’s Taco Bowls over at Budget Bytes, if you need a real recipe from a real food blogger... or you can just keep it simple, like I do. We’re basically going to assemble an all-star cast of burrito fillings and dump them in a bowl. Easy, no? First thing that’s gotta get on the stove: saffron rice. You could make your own, or use this same stuff I showed you way back in the salsa chicken post. I suppose white rice could do, but I prefer seasoned, and pre-seasoned is even better. If you’re not of the vegetarian persuasion, you might want some chicken. 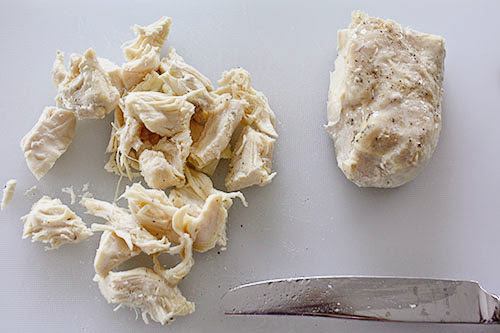 I had already baked a bunch of chicken breasts in advance, so I just pulled one out and cut it up to re-heat with seasoning. Speaking of seasoning, I went with a taco seasoning packet. You could use your own taco seasoning, or just dump in anything from your spice cabinet that seems like it’d taste good in a burrito. This is really not that challenging. 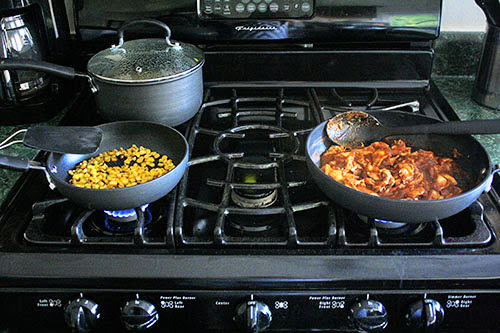 The other thing I get going on my stovetop, aside from the rice and chicken, is some of Trader Joe’s roasted corn. I know it’s ridiculous to buy it when I could probably make it for pennies on the dollar, but I’m lazy, and their roasted corn is so dang good. Once the rice, chicken, and corn are all simmering, I assemble the rest of the burrito bowl lineup. Today we’ve got sour cream, cheese, salsa, avocado, black beans (came from a can because easy), and lettuce. If we have olives, I add those for Mr. P. If we have leftover peppers from anything (jalapeno, bell, what have you) those can go in too. Basically, if you’d eat it in a burrito, it can go in here. Then assemble! I’m a fan of rice on the bottom, but you do you. Just be careful to add only a smidge of each item... these bowls get heavy fast. And that’s it. All the goodness that would be wrapped up in your burrito from Chipotle or wherever, without having to worry about subpar tortilla wrapping skills! Hope you enjoy! And if you’re currently also in a cooking funk... no judgment if you just make a bowl of cereal instead. This is easy, but... I feel ya.